My Inspiration for ‘A Shiver of Shark’ was seeing the Natural phenomena of the Great White and other Shark who corral and then attack shoals of smaller fish. As well as the Force of Nature this painting reflects, it is also the Natural Rhythm and Pattern which excited me. 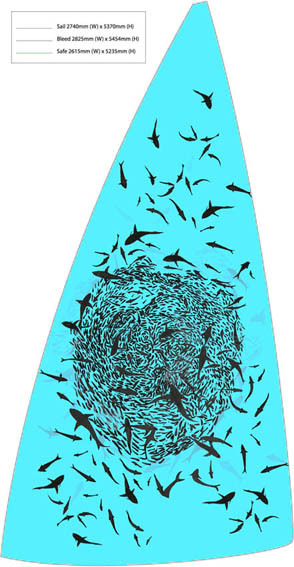 The Dark Silhouettes of the Sharks and smaller fish against the Turquoise Blue setting, creating an aesthetic and energy which I hope creates a strong visual statement. My paintings from the last 10 years reflect a personal story and aim to share subjects which explore universal themes either from nature, family or personal experience. My work seeks to communicate in a vital way what I experience and what inspires or affects me as an Artist. Some of my subjects have explored the difficult aspects of human experience like loss and bereavement but i hope within the painting of these difficult subjects I have been able to connect with an audience who has felt the feelings I have felt. After all we are all human and perhaps it is helpful to be able to share visually the real emotions which are sometimes difficult to express. Certainly my own creative practice has enabled me to process my own ‘raw experiences’ and i hope this may have helped other’s to express their feelings too. More recently i have been painting images from a less ‘narrative position’ and feel less beholden to past experiences to determine my Subject matter. Indeed i am painting with more instinct for paint and process. My current paintings are more abstract in form, born out of a more physical painting process. I have relinquished the necessity of seeking a subject and have been basing my paintings on the sensations and language gained from my painting experiences. I like to feel that my current paintings are more elemental when you experience them, like an experience in front of nature perhaps. The painting’s content encompasses my collective experiences translated into mainly monochrome surfaces, full of colour, form and optimism hopefully.